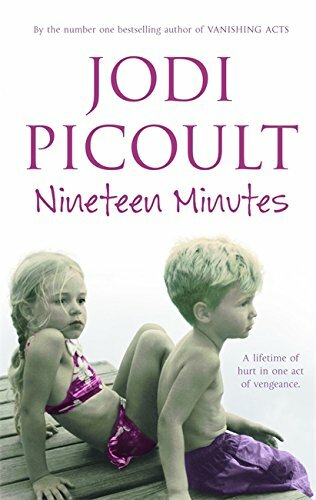 Best known for tackling controversial issues through richly told fictional accounts, Jodi Picoult's 14th novel, Nineteen Minutes, deals with the truth and consequences of a smalltown high-school shooting. Set in Sterling, New Hampshire, Picoult offers reads a glimpse of what would cause a 17-year-old to wake up one day, load his backpack with four guns, and kill nine students and one teacher in the span of nineteen minutes. As with any Picoult novel, the answers are never black and white, and it is her exceptional ability to blur the lines between right and wrong that make this author such a captivating storyteller. On Peter Houghton's first day of kindergarten, he watched helplessly as an older boy ripped his lunch box out of his hands and threw it out the window. From that day on, his life was a series of humiliations, from having his pants pulled down in the cafeteria, to being called a freak at every turn. But can endless bullying justify murder? As Picoult attempts to answer this question, she shows us all sides of the equation, from the ruthless jock who loses his ability to speak after being shot in the head, to the mother who both blames and pities herself for producing what most would call a monster. Surrounding Peter's story is that of Josie Cormier, a former friend whose acceptance into the popular crowd hangs on a string that makes it impossible for her to reconcile her beliefs with her actions. Jodi Picoult received an AB in creative writing from Princeton and a master’s degree in education from Harvard. The recipient of the 2003 New England Book Award for her entire body of work, she is the author of twenty-one novels, including the #1 New York Times bestsellers House Rules, Handle With Care, Change of Heart, and My Sister’s Keeper, for which she received the American Library Association’s Margaret Alexander Edwards Award. She lives in New Hampshire with her husband and three children. Visit her website at JodiPicoult.com.